The ruling All Basotho Convention (ABC) has cleared its former legislator Sello Maphalla to contest the post of secretary general after his Hlotse Constituency had challenged his eligibility on the grounds that he was once involved with the Lesotho Workers' Party (LWP). Mr Maphalla will slug it out with the incumbent, Samonyane Ntsekele; former Senate deputy president, Futho Hlooho; and Law and Constitutional Affairs Minister, Lebohang Hlaele for the top party post. The ABC will hold its conference on 1 and 2 February this year where the secretary general's and all other national executive committee (NEC) posts will be up for grabs. 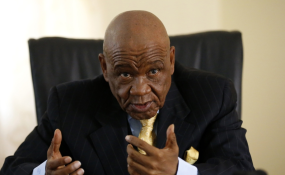 Only the party leader's position, currently held by Prime Minister Thomas Thabane will not be contested. Mr Maphalla was on Monday hauled before the party's disputes and resolutions committee after his Hlotse constituency filed a formal complaint challenging his eligibility to contest for the party post. The constituency had argued that Mr Maphalla was not eligible to contest because of his previous involvement with the LWP in 2007. Mr Maphalla said he was happy that he was cleared after the complaint which was based on a misunderstanding of the fact that he had been seconded to the LWP leadership by the ABC during the two parties' alliance. He said he was seconded to chair the LWP after its leader Billy Macaefa and secretary general Rose Lenea were elected ABC secretary general and women's league treasurer respectively under the ABC-LWP alliance in 2007. "I was called to appear before the (disputes and resolutions) committee on Monday after my constituency lodged a complaint but the matter has been amicably resolved, Mr Maphalla said, adding, "all parties are happy and I will contest the elections". He said that he had always been a loyal ABC member who was seconded by the party to the LWP under the 2007 alliance between the two parties. "The alliance worked so well that the ABC even nominated me for the speaker of the national assembly after the 2015 elections. This proved that I was still an ABC member who had only been seconded by the party to lead the LWP. In the last (3 June 2017) elections, I contested under the ABC banner in Hlotse and there were never any griefs," Mr Maphalla said. ABC spokesperson Tefo Mapesela confirmed to this publication that Mr Maphalla has been given the greenlight to contest in the upcoming party elections. "I have been given a report that the matter was resolved on Monday and he (Mr Maphalla) has been cleared to contest the elections. It must be clear that he was not called by the national executive committee but by the disputes and resolutions committee," Mr Mapesela said. Mr Maphalla further said that his fellow Hlotse constituency members "accepted that this was a misunderstanding". "We had warm and respectful discussions and we need to learn to handle issues similar to this one with maturity and respect for one another," Mr Maphalla said. He added that the Hlotse constituency committee had since written a letter proving that he was indeed an ABC member and that they would support his bid for the secretary general's post. The run-up to the ABC elections has not been without controversy after the ABC NEC rejected the nomination of National University of Lesotho (NUL) Vice Chancellor Professor Nqosa Mahao for the post of deputy leader. Prof Mahao had thrown his hat into the contest against Finance Minister Moeketsi Majoro, party chairperson Motlohi Maliehe and the incumbent, Prince Maliehe, who is also Transport Minister. He was nominated by the ABC's Koro-Koro constituency committee but the ABC NEC disqualified Prof Mahao on the grounds that he had not "served at the party's branch and constituency levels for at least 24 and 36 months" respectively as required by the ABC constitution. The Koro-Koro constituency committee however, insists that Prof Mahao meets the requirements to stand in the elections. The Koro-Koro constituency committee challenged the ABC NEC's decision and lost the case in the High Court on Sunday. It has since filed its appeal with the Court of Appeal. Meanwhile, Mr Maphalla says the secretary general must serve the ABC on a fulltime basis to ensure that the party grows in all aspects. The incumbent Mr Ntsekele also serves as Water Affairs minister. "The secretary general is the chief organiser whose sole responsibility is to run the office of the party and he should not have any other responsibilities. Secretary generals should not be ministers. We need a fulltime secretary general and anyone who would want a secretary general to be a minister would have erred. (If elected to the secretary general post) I want all my focus to be on the organisation," Mr Maphalla said. He also outlined his vision to see the ABC acquiring its own property including offices in keeping with its image as a large political party. "This is the second time that the ABC is leading a coalition government (after having first done so from 2012 to 2015) but there is no meaningful change in our organisation. For instance, we are still renting offices and that doesn't sit well with me as the ABC is a big organisation that ought to have its own assets," Mr Maphalla said. He said the party assets should include proper office structures to house its three leadership structures, namely the NEC and the women's and youth league committees. He said the part of the same property could be rented out to generate revenue for the ABC instead of the current situation where the party relied on M2 subscriptions from members. He also expressed his displeasure with what he said was a situation where the government was dictating terms to the ABC and yet the former got its mandate from the party. "My understanding is that the government should run on the party manifesto, not to dictate to the party. For instance, the party should work closely with the Prime Minister when appointing ministers because this will limit internal fighting and prevent name-calling like likatana (dirty rag) and others," he said. Dr Thabane had tongues wagging on Sunday when he told ABC supporters in His Ha Abia, Maseru constituency that Prof Mahao was a "rag" who should not be elected to deputise him. Dr Thabane has since apologised his "harsh words when talking about Prof Mahao, which I later realised were not acceptable". Mr Maphalla said his election into the ABC NEC would not prevent him from criticising the party and government whenever it was necessary. "Being appointed secretary general will not stop me from exploring other greener pastures and nothing will prevent me from analysing pertinent issues in honesty," the 58-year-old Mr Maphalla said.